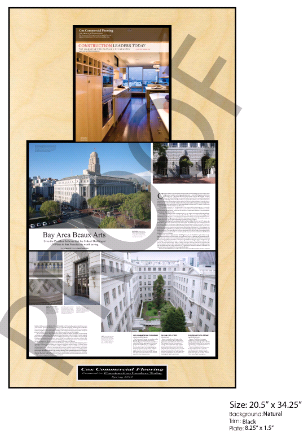 Magazine frame | How architects and designers display articles. Have you ever received a compliment that blew you away? Knocked your doors in and made your chest expand with pride. Well, think of that moment and realize how we feel as a manufacturing company when we get orders to produce a magazine frame for architects and designers who are featured in their magazine and trade publications. At In The News we tend to think we are our own worst critic so when an opportunity comes up to recognize achievement and reward creativity in architecture and design we get excited. Whether a featured design firm in the Oklahoman newspaper like Rees Associates wins recognition and praise for their new design for and eatery for NBA stars or Cox Commerical Flooring featured in Construction Leaders Today for their work on the Federal Building in San Francisco we take each order with a sense of pride. These design and construction firms can probably do the job themselves but they come to In The News to create their wall designs. Yes, we think our magazine framed article plaques are the best- Shocker!! It is too easy to just say that and not explain. We custom each individual magazine frame to fit the needs of the customer. What we mean is we are not going to have a red trimmed and purple matted framed article for every one who orders from us. We are not going to try and create the same style magazine frame for a high school state champion as we would a world renowned design team. We know this because we ask questions and garner feedback from the professionals. We always are looking for ways to better or production and appearance of our magazine frames because we know it's important for us and you. Was a building you designed featured in an architecture magazine? Is your beautiful home often spotlighted in home & garden publications? Whether it’s building, construction, interior design, or landscaping, we would be happy to preserve your home or career’s highlights with a beautiful wall plaque designed to impress. Ready to get started on your display? Not convinced yet let us show you more. If you have an recent or old article and are wondering what a magazine frame of your actual article would look like then click our button below to get a free digital preview. Want to learn more about how displaying your press can help check out our guide below for tips to capitalize on your media success.